There were many notable aspects of Xavier Jara’s recital for GuitarSarasota Saturday evening, other than the expert and delicate skills of the young guitarist, including the rapt and silent attention paid to the music by a large and largely mature audience. This program may have surprised some as it was devoid of the usual “crowd-pleasers” often associated with this instrument. Instead, we heard transcriptions of historically significant music and new works written for the modern guitar, including compositions by John Dowland, Johann Sebastian Bach, Antonio Vivaldi, Isaac Albeniz and Castelnuovo-Tedesco, framing works by contemporary composers such as Dusan Bogdanovic and Jeremy Collins. Throughout this challenging program, and in an atmosphere of fine acoustics and intense audience focus, the young soloist maintained expert and cheerful control of his instrument and the demands of the music, never going for an easy effect or a virtuosic stunt. After leading off with the first item on the printed program, 17th-century John Dowland’s “Two Fantasies,” played with great restraint, Jara introduced the compositions that followed, beginning with a mysterious work by Francois Couperin with unexpected harmonies. Later, we heard a lengthy and compelling modern composition by Collins, a composer born in 1986, and Bogdanovic’s Sonata No. 3, a well-regarded “minimalist” work that incorporates some jazz elements, kept the audience’s attention despite its intricate textures and challenging harmonic language. Graeme Koehne’s “A Closed World of Fine Feelings of Grand Design” lifted the weight of its long title in music of calm simplicity. After lengthy and insistent applause and a standing ovation, Jara delivered a sweet and calming encore — a sonata by Alessandro Scarlatti, founder of the Neapolitan school of 18th-century opera and an enormously productive composer in other forms. The success of this recital, a program of demanding compositions which avoided the musical clichés frequently associated with the guitar, is a significant indication of the maturing taking place in the Sarasota music atmosphere. Although it was rapturously received by the audience, the lack of younger attendees points to a continuing need to remove the remaining stigma often attached to so-called “classical” music. Mr. Jara rocked the joint and those of us who attended were given a welcome dose of gifted youth. Classical guitarist and winner of the Guitar Foundation of America’s Rose Augustine Grand Prize Xavier Jara, who performed in Kulas Recital Hall Wednesday night, not only demonstrated his instrument’s impressive time- and genre-crossing capacities, but also shed light on the community of classical guitarists and enthusiasts in Oberlin. 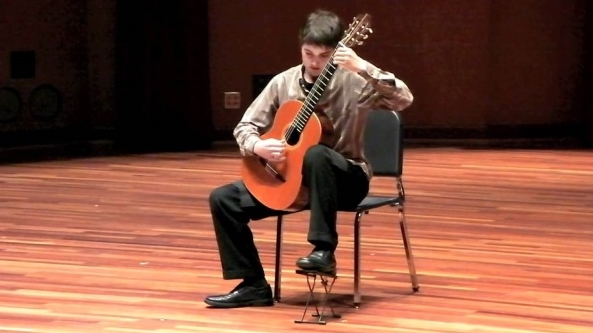 Jara’s performance was in fact sponsored by the Oberlin Classical Guitar Association. After Jara gave a masterclass on Monday, he was joined by members of the OCGA — social media coordinator and double-degree senior Mohit Dubey; treasurer and double-degree senior Brian King; and OCGA member and double-degree sophomore Aidan Wiley Lippke — who talked about the poetic names their instrument has been assigned. “Someone once called [the guitar] a tiny orchestra … who said that?” Dubey asked. “It was God,” King replied, to general amusement. Though the phrase was actually coined by guitarist Andrés Segovia, King’s joke wouldn’t have seemed off-base to the audience who attended Jara’s Wednesday night performance. The award-winning guitarist, not much older than the many Conservatory guitar majors in the audience, sat with his left foot suspended on a footrest, his instrument propped on his knee and nearly vertical. His left fingers jumped up and down the guitar’s neck while his right hand shimmered across the strings to produce a sound that was nothing short of orchestral. The guitar is one of the few instruments that has a firm standing in the culture of classical music, yet remains a keystone of popular music. Professor of Classical Guitar Stephen Aron, who has been the faculty advisor for the OCGA since its inception in 1993, elaborated in an email to the Review. “Many people attend classical guitar concerts [who] might not normally attend other classical concerts, even though the music may be every bit as sophisticated, complex, or opaque as one might find at a contemporary chamber music concert or symphonic program,” Aron wrote. The primary work of the OCGA is to build on that accessibility, and to provide a voice and funding for a department that did not have the same level of institutional funding as others for a long time. While the OCGA focuses exclusively on classical music — though not just guitar, as they will be bringing a flutist in as a guest judge for the James Stroud All-Ohio Classical Guitar Competition and Festival in the spring — many classical guitarists, including Jara, got their start playing popular music. The day he turned 18, Jara moved to France, where he lived for six years with Perroy as his mentor. He attended the Conservatoire de Paris and began participating in competitions, after receiving his Bachelor’s Degree. He has earned prizes at competitions including the 2014 Boston Guitarfest, the 2015 Gargano, Italy competition, and the 2016 Tokyo International Competition. After winning the Guitar Foundation of America’s highest prize, he did what he had been desperately wanting to do: stop competing. Since then, he has recorded his first album, acquired an upcoming book publication deal, and is now in the midst of a 60-concert tour that will span the United States as well as venues in Canada, Guatemala, Panama, Mexico, and possibly China. Jara’s emotion and artistry shone in even his first moments on stage. His eight-piece show at the Oberlin Conservatory began with a piece by 16th-century composer John Dowland, then jumped “about 200 years into the future,” and finally arrived at the 21st century compositions of Ohio native Jeremy Collins. Throughout the show, there was emphasis on classical guitar repertoire’s collaborative and interwoven nature — for example, Bach’s Concerto No. 1 in D Major, BWV 972 was an arrangement of Vivaldi’s work — and later, that arrangement was arranged for the guitar by Perroy, Jara’s mentor. Such collaboration lies at the heart of the OCGA as well — it is made of people who are excited about what they love, love being excited about it, and endeavor to share it. As the OCGA members watched Jara’s performance, they turned to smile at one another, snapped their fingers, and bobbed their heads and shoulders along with tunes they knew well. It was pure, unadulterated musical excitement — and it will be repeated with performances later this year by Jorge Caballero, Benjamin Verdery, Matthew McAllister, Nigel North, the Cavatina Duo (Denis Azabagic and Eugenia Moliner), and James Piorkowski. 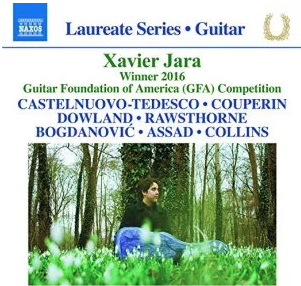 Winner of the important Guitar Foundation of America (GFA) International Concert Artist Competition in 2016, Xavier Jara—the first American to win since Martha Masters in 2000—has made an intriguing and satisfying debut disc (which is part of his Grand Prize package) that nicely juxtaposes Renaissance and Baroque works by Dowland and Couperin, with a gaggle of modern composers, including Mario Castlenuovo-Tedesco, Sérgio Assad, and Dusan Bogdanovic. Castlenuovo-Tedesco’s Variations à travers le siècles (Variations across the centuries) provides a quite natural bridge between the old and the new. There are two quite different modern elegies here by composerrs new to me: The one by Alan Rawsthorne is somewhat dark and contemplative, while Jeremy D. Collins’ starts outpretty and lyrical, builds to a furious crescendo, drops back into another quiet passage which grows into an exultant and then pensive reverie for the departed. It’s altogether a superb piece. Jara takes more chances than a lot of the players in Naxos’ Laureate Series on this Recital disc, but sounds utterly confident and at ease with his choices, down to his somewhat bold inclusion of Bogdanovic’s Sonata No. 3, with its abstract jabs and violent conclusion. It’s certainly easy to understand why Jara has fared so well in the world of competitions. You can stream or buy this album through Amazon, or hear it in its entirety on YouTube, as well as on Apple Music and Spotify. Raymond Bisha introduces the latest release in the Naxos Guitar Laureate series. 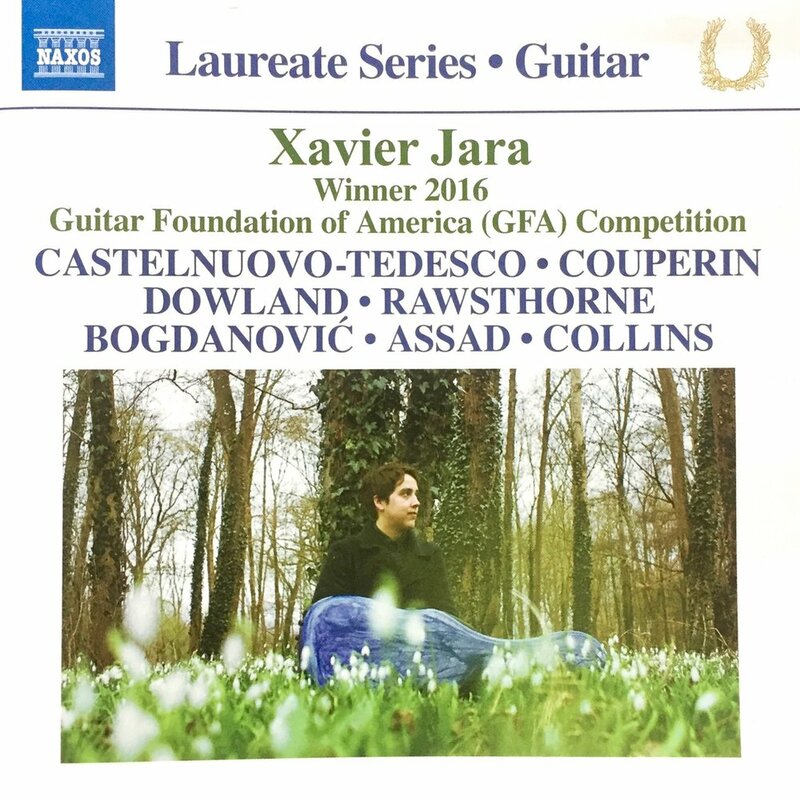 The featured performer is Xavier Jara, winner of the 2016 Guitar Foundation of America Competition, adding to the artist’s ongoing string of successes. The acoustic guitar has an ancestry that can be traced back thousands of years; this recording presents music from the last five centuries, with a stylistic range that clearly affirms the instrument’s versatility. MÉRIDA, 10 Ago. 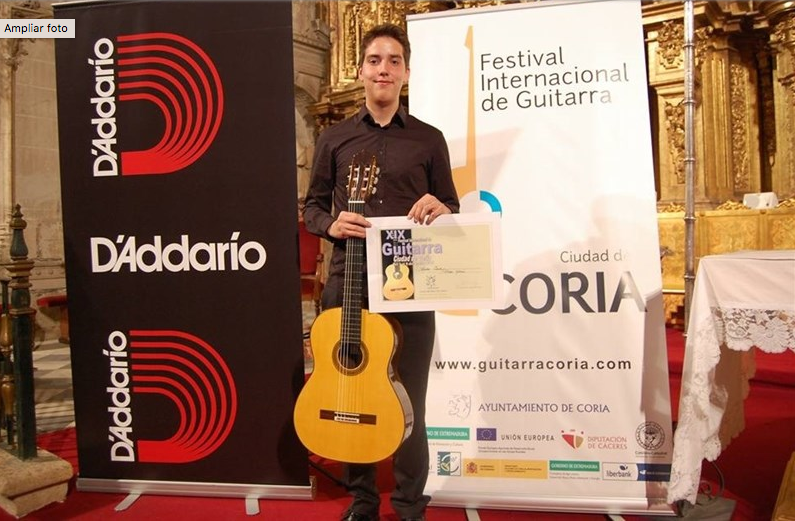 (EUROPA PRESS) - El estadounidense Xavier Jara, de Minneapolis, ha ganado este pasado sábado, día 8, el XIX Concurso de Guitarra 'Ciudad de Coria' y ha obtenido también el 'Premio del Público'. Así, el jurado ha proclamado como ganador Jara; al que le ha seguido en segundo lugar Antoine Morinière, de Francia; en tercer lugar Marko Topchii, de Ucrania; y la cuarta posición ha sido para Elena Fomenko, de Uzbekistán. En nota de prensa, el Ayuntamiento de Coria ha señalado que el concurso ha sido "todo un éxito", tanto por la asistencia de público y organización como por la "gran" música de estos artistas que hizo disfrutar al público. De este modo, cada concursante dispuso de 25 minutos para "deleitar a los asistentes con su mejor música"; así, en primer lugar actuó el concursante Xavier Jara, de Estados Unidos, que interpretó a John Dowland (Dos fantasías), Domenico Scarlatti (Sonata K.53) y Dusan Bogdanovic (Sonata n°3). Después, el segundo concursante fue el francés Antoine Morinière, que tocaba Fantasía Dramática, de Napoléon Coste, y la Sonata de Alberto Ginastera, y la tercera actuación corrió a cago de la guitarrista Elena Fomenko, nacida en Uzbekistán, y lo hizo con Johann Sebastian Bach (Allemande de la suite BWV 1004) y Nicholas Maw (Música de la Memoria). Cabe destacar que mientras el jurado deliberaba, el público asistente votaba en urna al guitarrista que más le había agradado para así poder elegir el 'Premio del Público', que lo ha obtenido el gitarrista estadounidense Xavier Jara. O músico norte-americano Xavier Jara foi o vencedor do Concurso Internacional de Guitarra de Viseu, que se realizou este ano pela primeira vez, anunciou hoje a Câmara. Ao conquistar o primeiro lugar do concurso, Xavier Jara obteve um prémio de seis mil euros e a garantia da participação em dois concertos: um no Festival de Música da Primavera de Viseu do próximo ano e outro no 40.º Festival de Guitarra Kaspar Mertz, em Bratislava. Em segundo lugar ficou o guitarrista Bogdan Mihailescu, da Roménia, enquanto o terceiro lugar foi partilhado por Marko Topchii, da Ucrânia, e Jérémy Peret, de França. O júri da iniciativa era constituído por Danijel Cerovic e Goran Krivokapich (Montenegro), Judicaël Perroy (França), Margarita Escarpa (Espanha), Paula Sobral, Pedro Rodrigues e José Carlos Sousa (Portugal). O concurso contou com 23 concorrentes de 16 nacionalidades, nomeadamente Portugal, Japão, Roménia, Espanha, Ucrânia, França, Alemanha, Chile, Coreia do Sul, Israel, México, Inglaterra, Polónia, Itália, Eslováquia e Estados Unidos da América. "A ideia foi tentar trazer para dentro do festival mais actividades que o pudessem enriquecer e dar-lhe uma dimensão internacional. O festival já ia tendo alguns músicos que convidávamos, mas apenas para concertos e 'masterclasses'", explicou à agência Lusa José Carlos Sousa, director do Conservatório Regional de Música. O presidente da autarquia, Almeida Henriques, acentuou a importância da internacionalização do Festival de Música da Primavera, este ano com o concurso de guitarra e, em 2015, com outro de piano.